My fiancé and I were delighted when we found Zuzana’s shop. Her designs stood out amongst the dozens of other jewellers on Hatton Gardens. Zuzana listened to my brief and came up with a beautiful idea for my engagement and wedding ring based on my work as a garden designer. If you don't like the run of the mill designs for jewellery, ZJ is for you. I was initially very wary as there is only a mobile phone number but, having checked Zuzana’s shop exist via Google Earth, I ordered a Peridot ring. Communication was excellent, delivered as required, I was very pleased with end result and I have earned quite a few "Brownie" points with my wife! 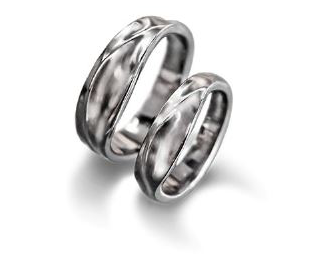 My husband and I are very pleased with the wedding bands we had made at Zuzana Jewellery. The service was quick, considering my band had to be custom made to fit with the engagement ring, and the results are fabulous! 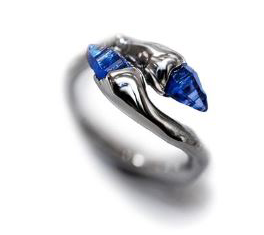 After experiencing a heartbreaking burglary in which a ring with great sentimental value had been stolen, I approached Zuzana Jewellery with a very general idea of a `medieval-style' ring set in semi-precious stones. Zuzana helped me design it, and I could not be happier with the results. Everyone comments on it and I always tell them I was inspired by a 12th-century crown spotted at the Musee du Moyen-Age in Paris. 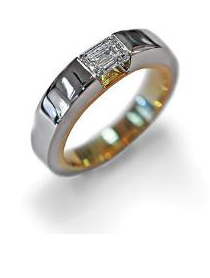 When we were looking for our wedding rings, we wanted something distinctive, different and personal. Some online research on London jewelers brought Zuzana’s shop to our attention and it was with some excitement that we paid her a visit. Looking at the array of rings generally available in the many jewellers on Hatton Garden, and then in the Zuzana’s window, it was clear to us that the rings were head on shoulders above everything else we had seen. It was an absolute pleasure to work with Zuzana, we recommend her highly to anyone wanting a beautiful and distinctive ring, and given the quality of design and craftsmanship, at a very reasonable price. Absolutely perfect! We are incredibly grateful for all the help with designing our very own special engagement ring and wedding bands. I knew exactly what I wanted and Zuzana delivered it perfectly in such a friendly and supportive way. In few words, we are truly very happy with Zuzana's service and interactive client approach. Her design is very nice and full of fresh ideas which makes it different in a comparison to other jewelry. My wife and I found the service at Zuzana Jewellery to be excellent, the design and production was done exactly as we wanted with quality workmanship. I was really impressed with the design and craftsmanship that went into the engagement ring I requested. I felt the personal service I received was exceptional, never feeling like I was wasting time while I considered my options and alternate designs. Zuzana was lovely, happy to guide me through all aspects of the design and purchase while maintaining a friendly approach. I have recommended Zuzana Jewellery to several of my friends since. Since my sister first went for a wedding ring, our whole family have had jewelery custom designed by Zuzana. She will work with you on your own idea and send virtual mock-ups and agree a price before anything is made. All in all, exceptional service, good value and an excellent end product. We refer to her as the family jeweller these days! My fiance and I picked Zuzana Jewellery to make my engagement ring as we felt that we would get more personal service in a smaller shop. We particularly liked the fact that Zuzana was actually working and making jewellery when we walked in. The design process was quick and the computer program Zuzana used made it very easy to visualize what my ring would look like. The end result is perfect and exactly what I wanted. Zuzana even made extra effort so that I would get my ring before Xmas. I couldn't have asked for quicker, better service and end result! Zuzana Jewellery is one of the best-kept secrets on Hatton Garden in London, even though the store is hiding in plain sight amongst the myriad of similar jewellers stores. You will get amazing pieces for your money and the best customer service you could ask for. Zuzana is professional, welcoming but not pushy at all, and can be trusted. After all they offer a truly custom made service tailored to each individuals needs. You won’t find a sales person in their store, just friendly, dedicated craftsmen who help us design and created both our wedding bands and engagement ring just the way we wanted them. Located in the Diamond Central of London, Hatton Garden.